Do you know how much stuff you can fit on a two terabyte SD card? Nine trillion hours of 1080p video, 37 kabillion emails and four King Charles Spaniels. Minimum. 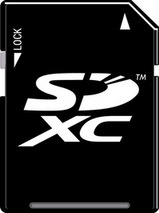 Now, don’t get too excited, because it’s still in the development stages, but Panasonic has today announced their next generation of memory cards, dubbed the SDXC. They’re not available yet, but Panasonic promise they’ve got a 64GB version in the immediate pipeline future. And, the capacity is there to store up to 2TB, in the future, with read/write speeds at 300 megabytes per second.